This is a continuation of the Fairy Frolic stories. Click link to read previous ones. baked cookies, made a gingerbread house, listened to a chamber music concert, and today, after playing all the games they had brought, everyone set up their sleeping bags and fell into an exhausted sleep under the Christmas tree. Everyone, that is, except for Camille. Camille was wide eyed and wakeful because tonight was a special night. She had been looking forward to tonight ever since she’d checked the calendar at school that showed all the phases of the moon. Tonight was a full moon night. She knew fairies hardly ever came out in the winter time. She actually had no idea if they went somewhere for the winter or if they hibernated in the trees, but tonight she was going to at least try to find out. She felt a special little thrill of anticipation and excitement. But she couldn’t get up yet. It wasn’t time. 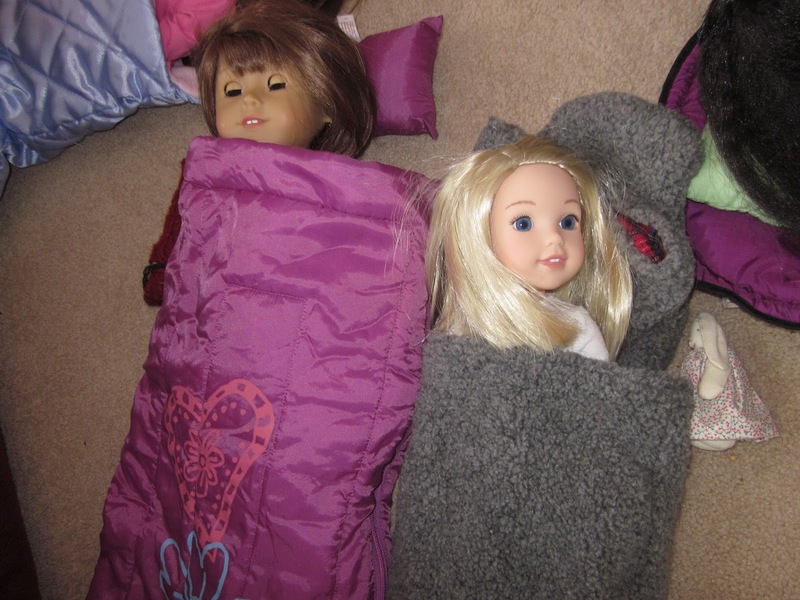 She lay in her sleeping bag trying to stay still, but quivering with excitement as she listened to the gentle tic of the grandfather clock. Tic,..tic,… tic. She smiled, wiggling her toes again. She loved the sound of the clock. It was comforting, and soothing, and present. It helped her to relax because her mind and heart were wild, crazy, and absent, imagining what might possibly await her in the outside world of the fairy forest. At last the clock chimed 1 am. She waited two more minutes, listening to the echo of the grandfather’s clock’s melody replay in her head. Then she jumped up and wiggled out of her sleeping bag. Katelynne squinted at her, “What?” she whispered back. Katelynne was truly just as excited and thrilled as Camille to be going outside and visiting the fairy forest for the first time since this summer, but she couldn’t help joke-complaining to Camille anyway. 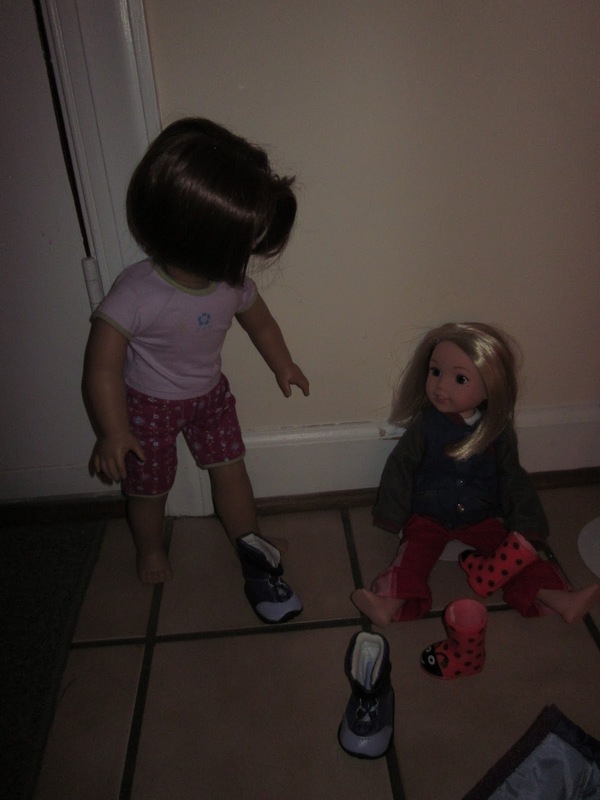 Camille did as she was told and slipped her ladybug boots on, but unlike Katelynne, she was far too impatient and excited to put her snowpants, mittens and hat on. She bounced up and down as she waited for Katelynne to belt her buckle and slip her mittens on. 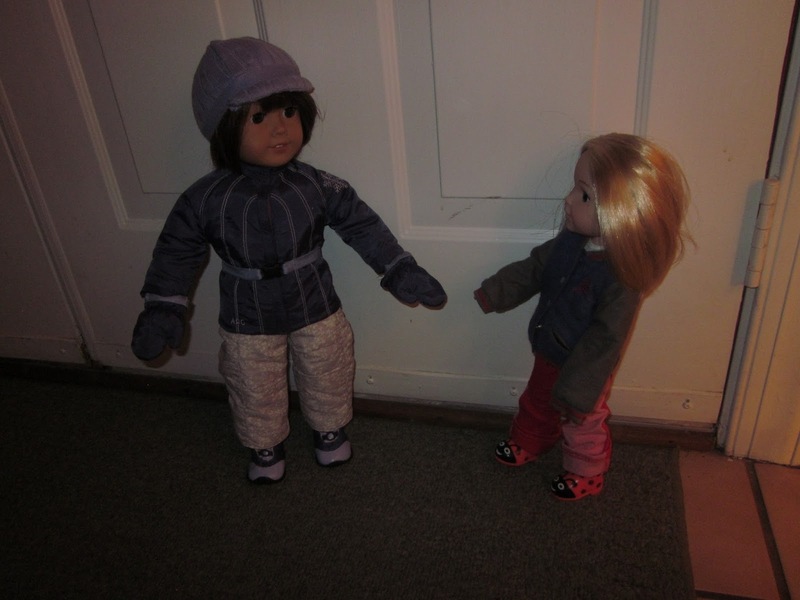 Katelynne opened the door and they slipped out into the cold. They stood still for a while in the back yard, getting used to their surroundings. 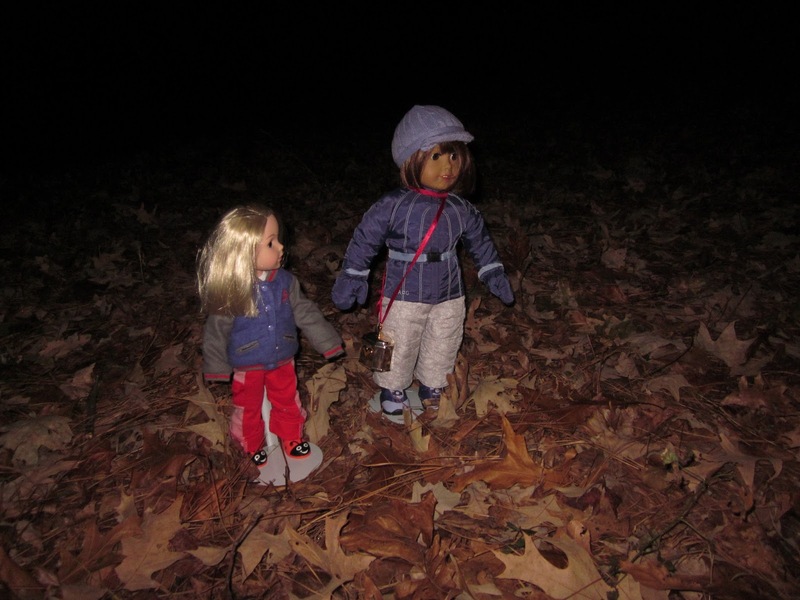 Even with the full moon, it seemed very, very dark for city girls like Katelynne and Camille. 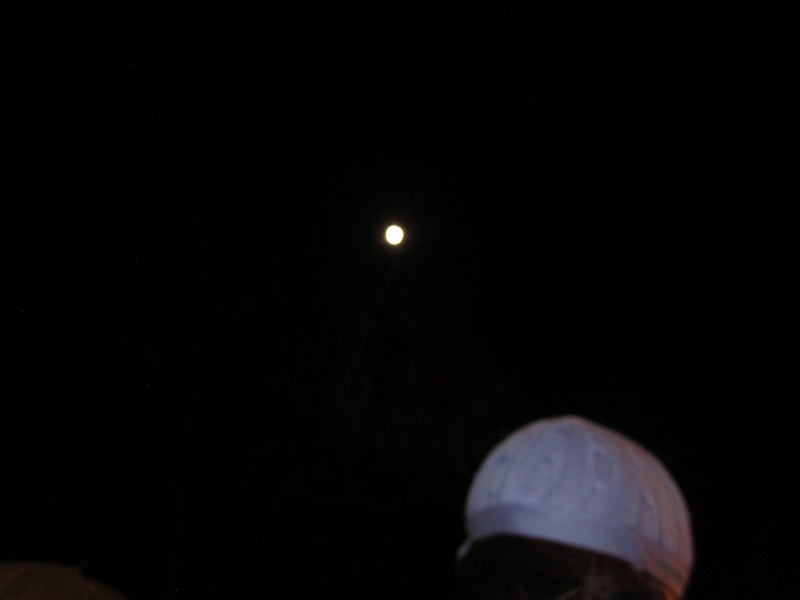 Camille looked up at the full moon, and filled her lungs with the deep wintry air. Despite the cold, the air tasted surprisingly fresh. Camille knew she didn’t need to answer, Katelynne knew the answer already. But hearing Katelynne say that to her filled her heart with such delight, joy, and love. It overflowed and tears sparkled in her eyes. 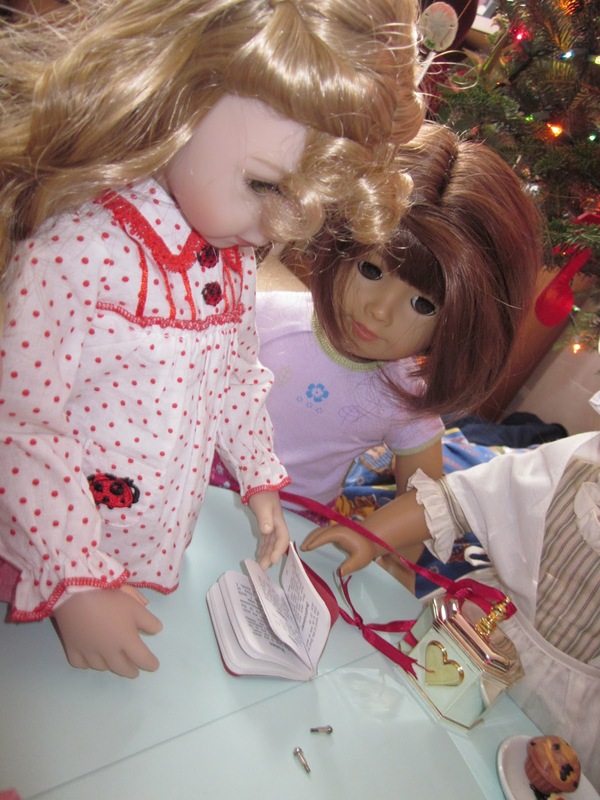 She grasped Katelynne’s hand, squeezing it with all the fervent answer and thanks her heart could give. And off they went. 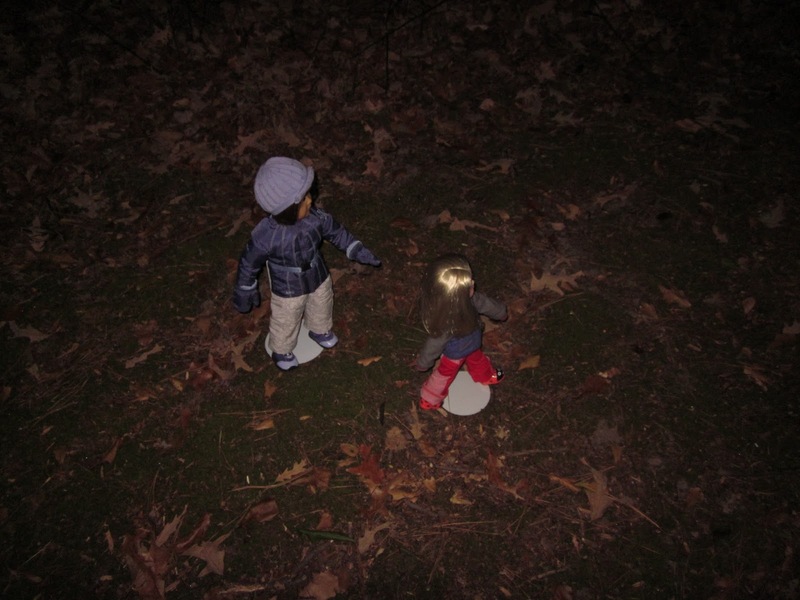 They started walking across the backyard but their hearts were so filled with gladness of being alone together, outside, going to a memory-filled place of wonder, they ended up running and skipping and laughing softly until they got to the edge of the forest. “Wow,” Katelynne said in admiration. 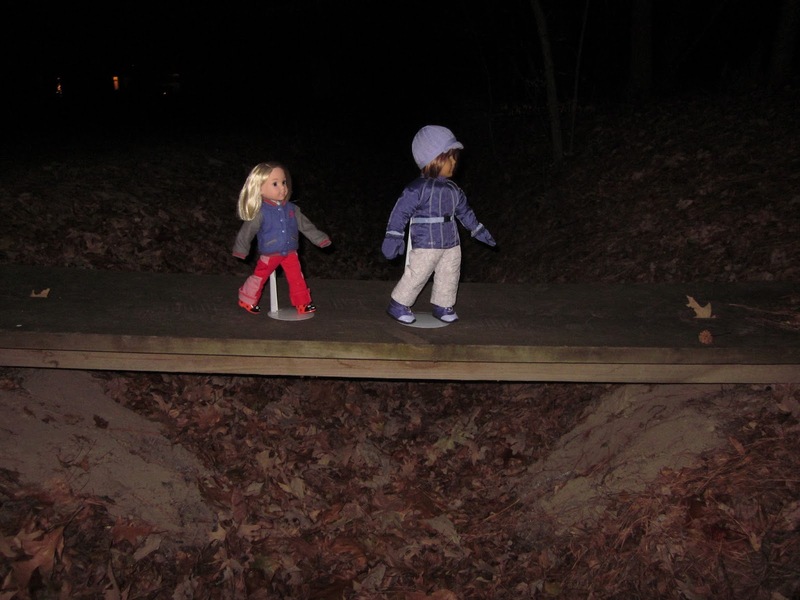 She turned back around and walked across the plank with Camille following confidently behind. 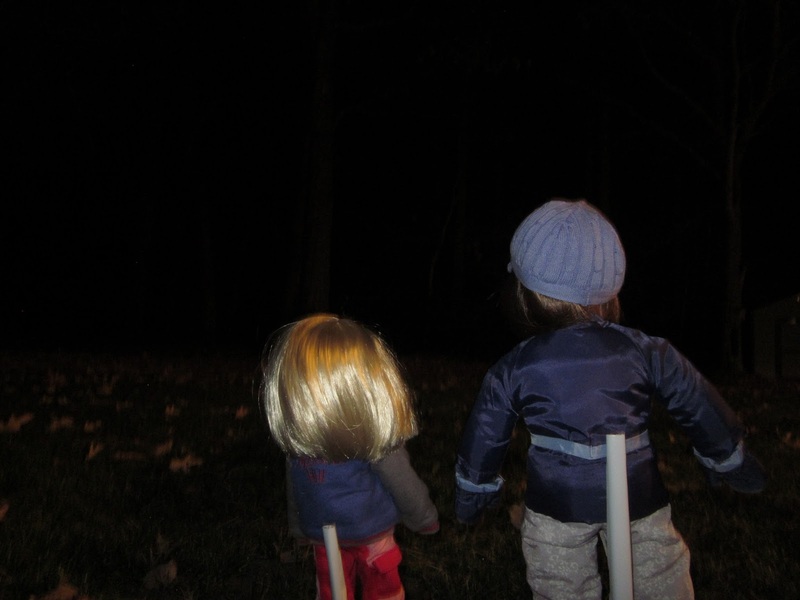 They started searching, walking along the path exactly where they had come four months before. “Hooray!!! We’re on the right track! The fairy house will be next!! !” Camille was giddy with eagerness at possibly seeing it and the resident inside. But fairy forests change all the time, every day. 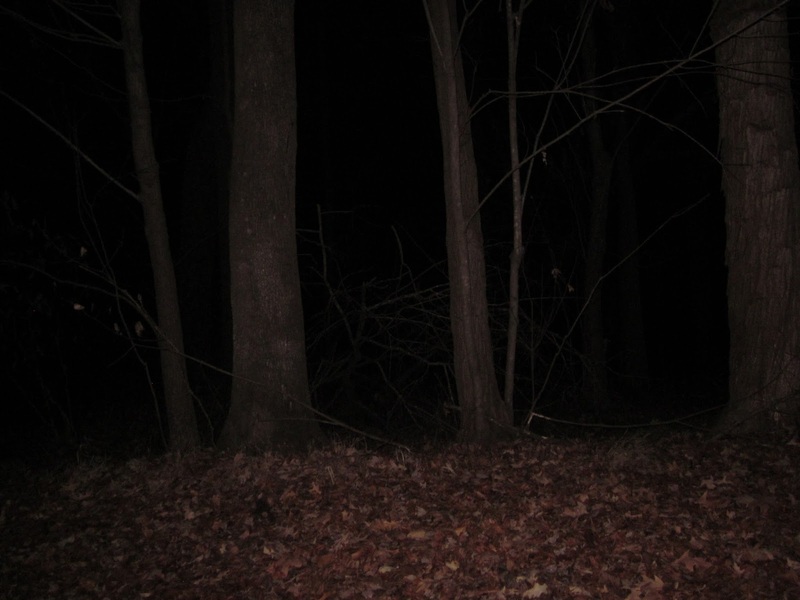 And hiking through one that hadn’t been explored for months, in the dark, in the middle of winter was a most divergent thing to do. Suddenly, the path ended. In fact, it didn’t just end, it disappeared altogether! 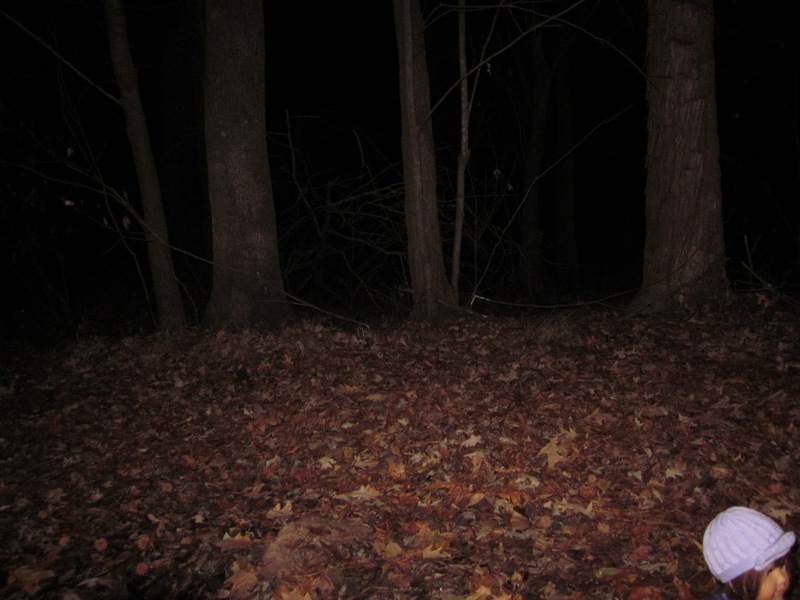 Trees surrounded them on all sides, and instead of moss and pine needles under their feet, fallen leaves crunched under their toes. Camille came to her, and looked up through her tears and the branches of the trees, at the shining moon that was almost directly above them now. “Holy Spirit light?” Camille asked. 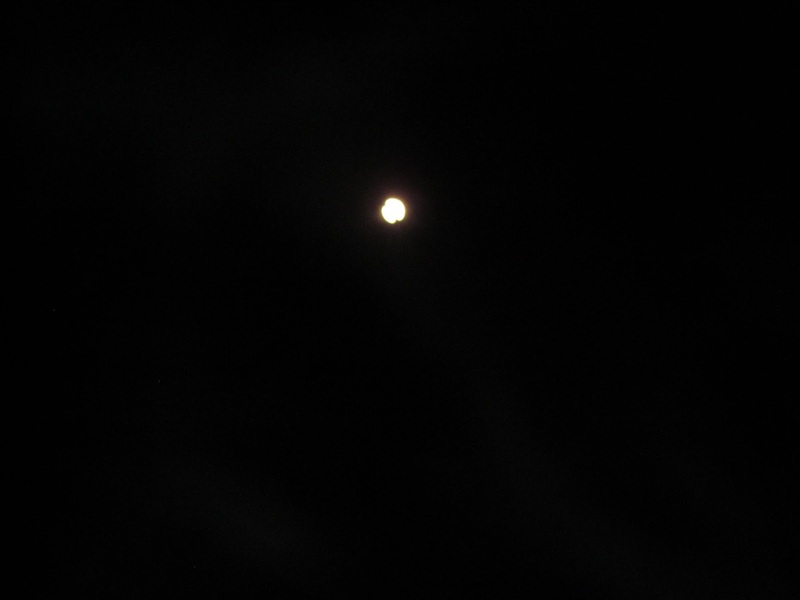 And sure enough, a ray of light from the moon shone down. 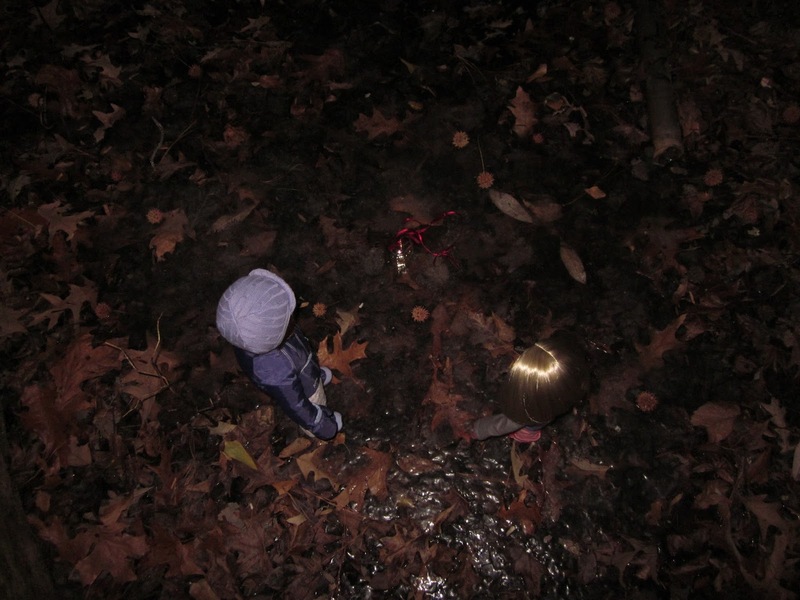 Katelynne looked where the light was shining and caught something glittering on the forest floor. She ran to it. Camille close behind. 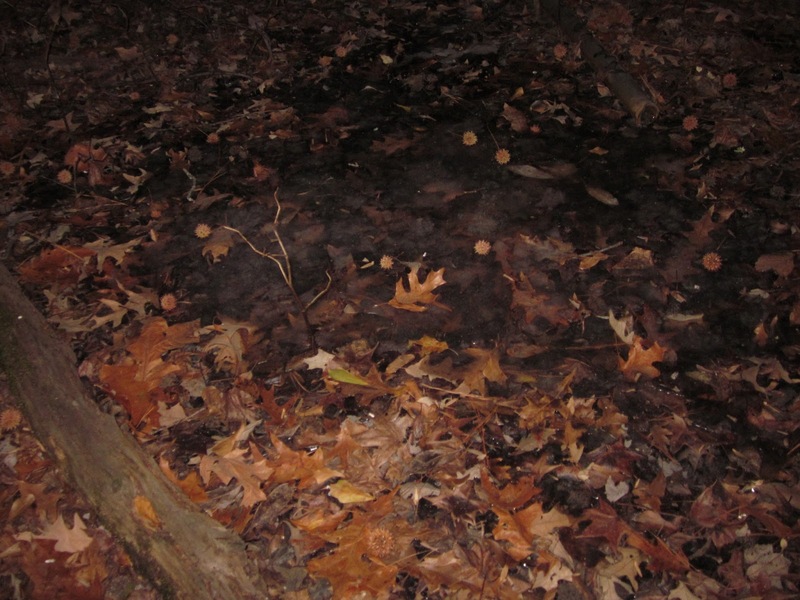 There was a clearing on the forest floor, near a log (the same log Katelynne had pointed out that grew the mushrooms in the summer) where the ground was shiny and gleaming. “LOOK!!! !” Camille cried. 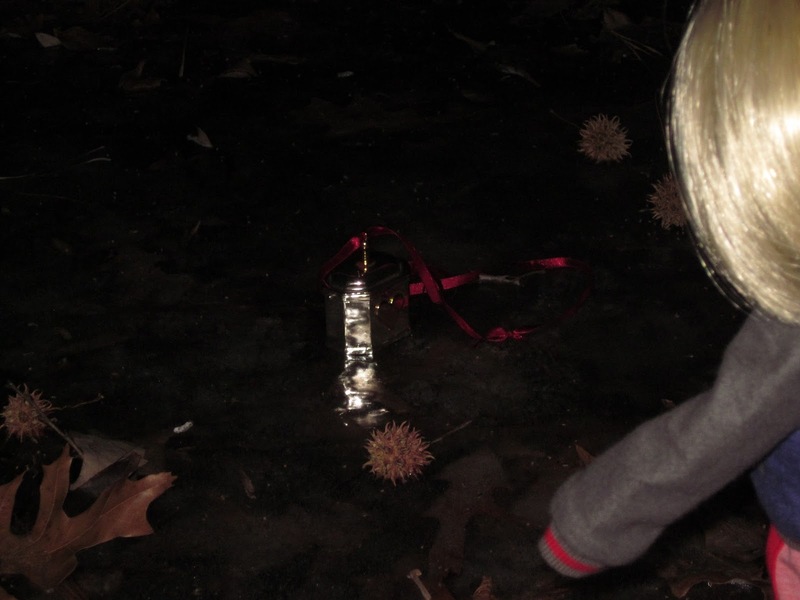 In the center of the ice-pond was a silver box with a ribbon tied to the top. “Is it for us? 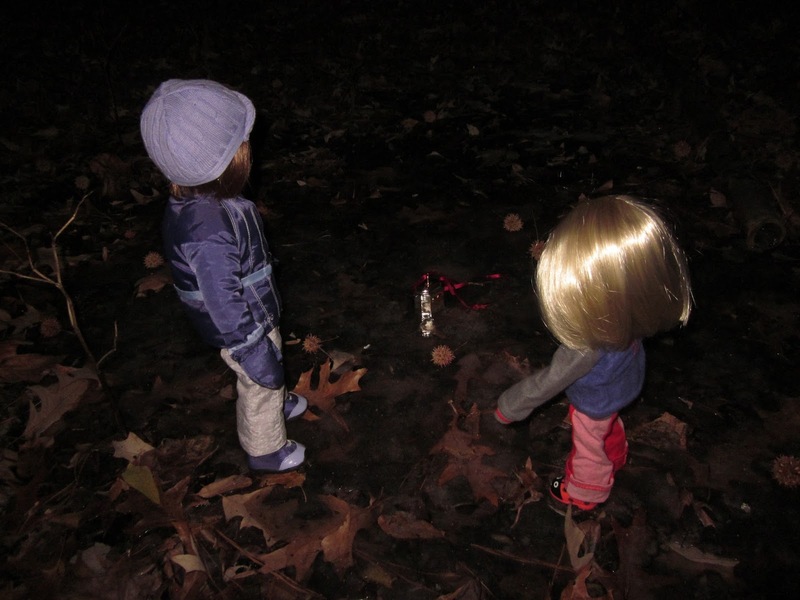 Should we take it?” The girls crept out onto the ice. 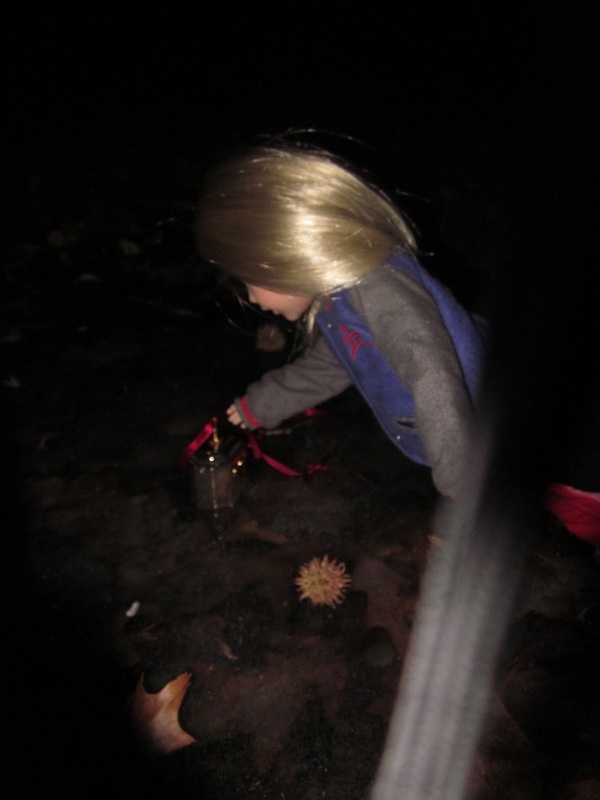 It was fascinating for Camille to see leaves underneath her feet, but not feel her feet walking on them. Instead she was walking on hard, cold ice. “Another gift from the fairies?” Camille asked again. It was beautiful. 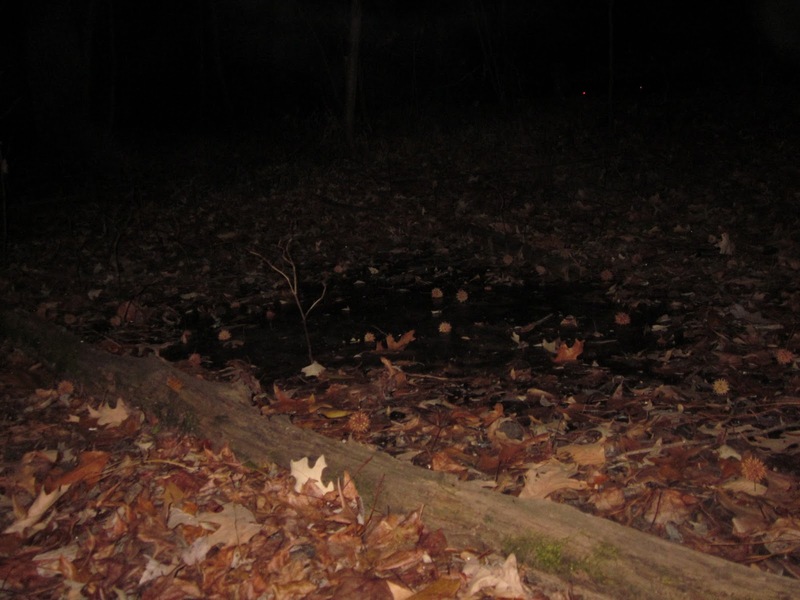 Perhaps it was the moonlight, but the sliver box seemed to be letting off a luminescent glow. Camille shooed away a few spiney marbles and reached down and grabbed the ribbon tied to the box. Again, just like the last time she had touched something not of this world, a dazzling thrill traveled through her body from her head to her toe, as if someone made her sparkle from the inside. “Come on, bring it here!” Katelynne sat down on the log, Camille set the box in between them. “Can we open it?” Camille asked. Camille made a scrunch face. 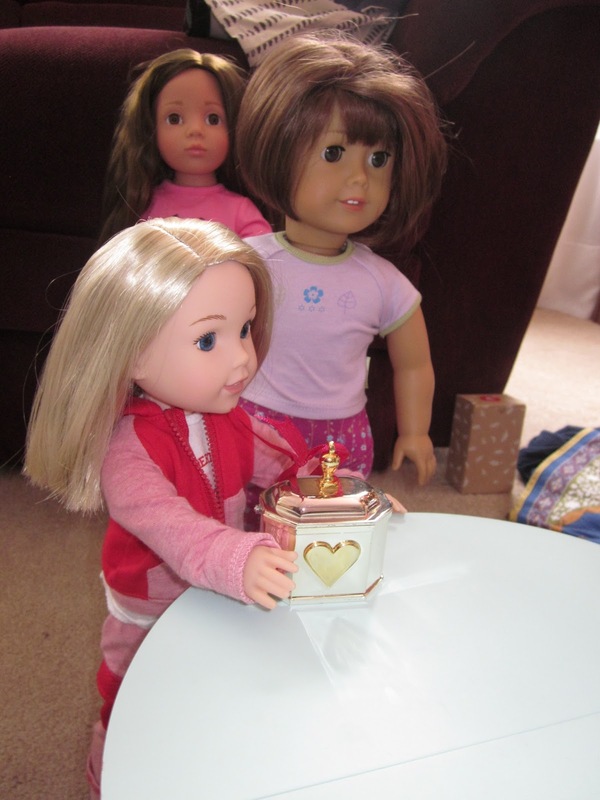 She was terribly excited and impatient to open it and waiting for the other dolls meant waiting all the way until the morning! And she selfishly wanted this whole thing to be special between just she and Katelynne, but she knew Katelynne was right. Hadn’t they all shared in the fairy festival together in their back yard? Of course she should wait. “Patience Practice….” she muttered. So many dolls were so good at it, but she was not one of them! “Come on, let’s run home so we can get to sleep so the morning will come that much faster!” Katelynne cried as she slung the ribbon over her head and started running with the box swinging at her hip. “Wait for me!” Camille cried, scrambling to her feet. “Little twinkling lights! I bet I know who’s house that is!” Katelynne started running even faster. Camille could barely keep up. 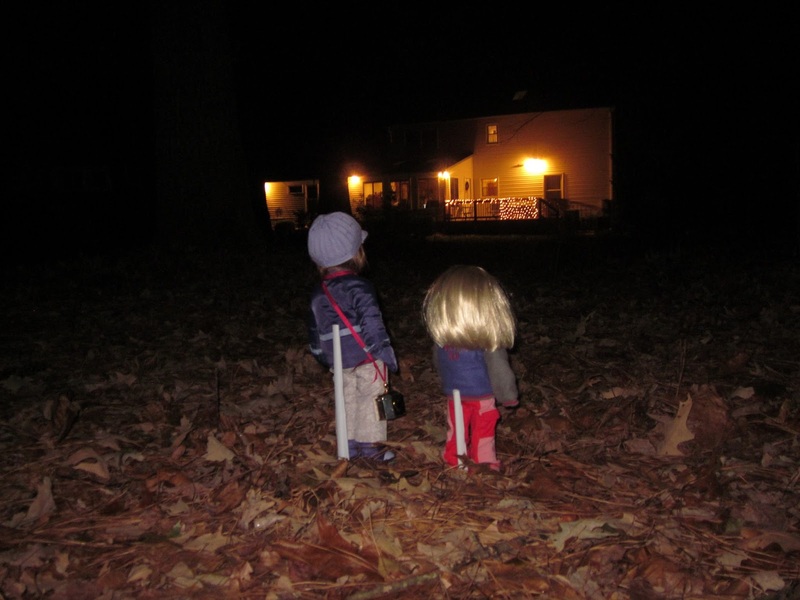 And sure enough as they got closer, the twinkling lights grew brighter and warmer until they were running along the wooden plank, through the edge of the wood, and across the back yard. “I’m so glad to see our house!” Camille said, hugging herself. Camille smiled and gave a deeply peaceful sigh, and leaned her head against Katelynne’s shoulder. 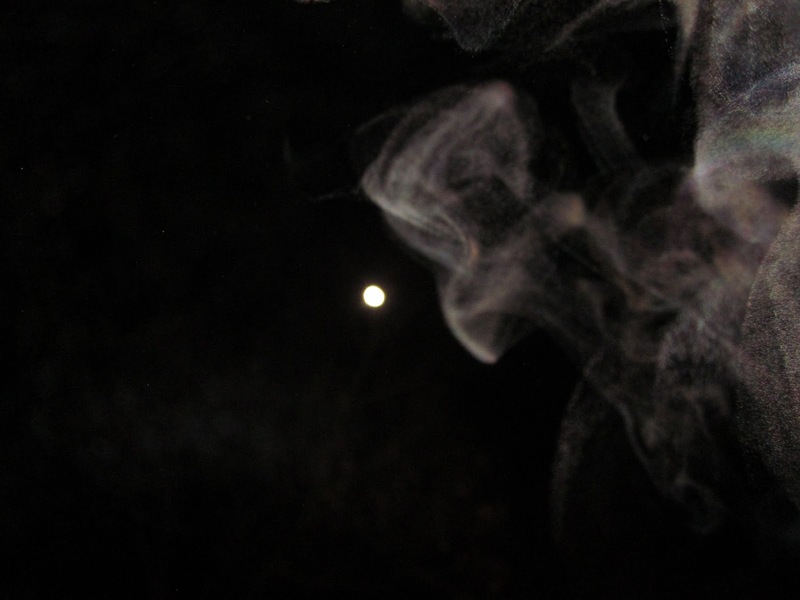 They both turned and stared up at the moon one more time and watched in awe as a fey fairy wind blew around it. The next thing Camille remembered was waking up and finding the room brightly lit in morning sunshine. 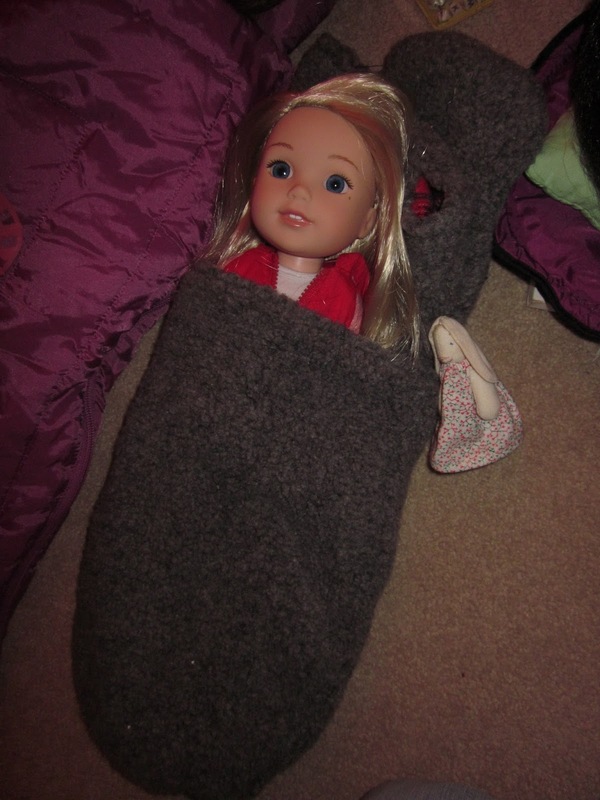 She had dreamed a most wonderful dream…..it seemed so real….she opened her eyes to find herself snuggly tucked in her sleeping bag with her boots still on her feet! The dream must have been real! 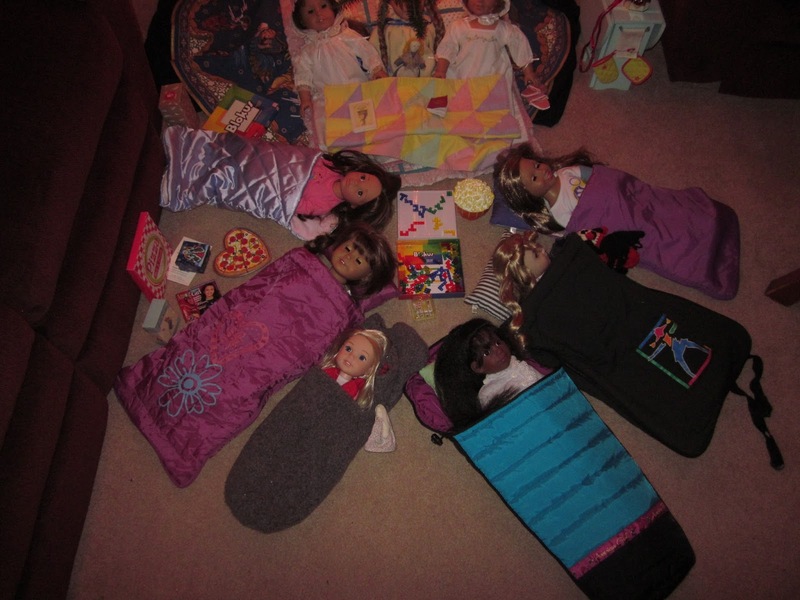 She rolled over and sure enough, the silver hearted box was exactly where she had left it in the middle of the circle of sleeping dolls! 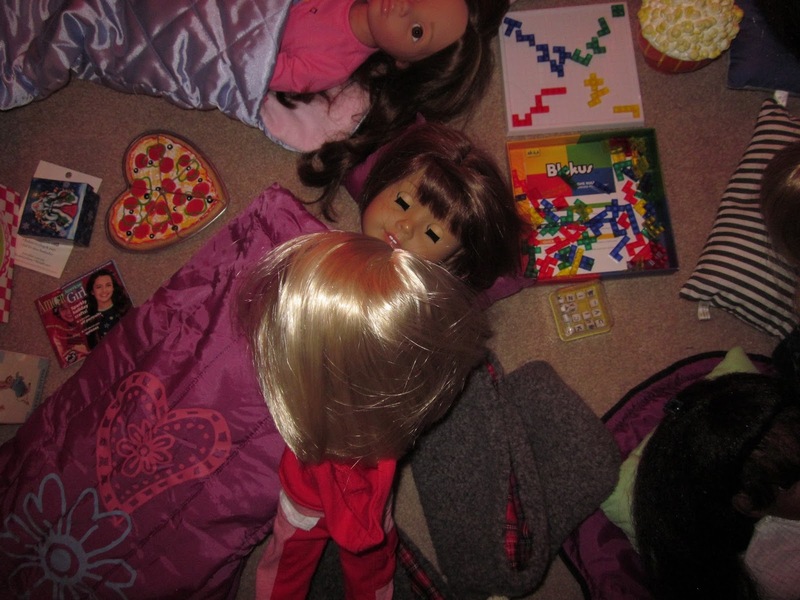 She wiggled out of her sleeping bag and pounced onto the box, grabbing it and waking grumpy Katelynne and all the other dolls up too, “Go bother someone else in the kitchen,” they grumped. Camille found Felicity and Kirsten already awake and having breakfast, “Look what we found!! !” Camille placed the box on the table. Katelynne came groggily up behind her. “Wow! A two hundred year old box that looks gleaming new!” Kirsten said. Camille grabbed the box and tried to lift the lid. It didn’t open. “Maybe there’s a spell you have to say to open it!” Annaleis said. 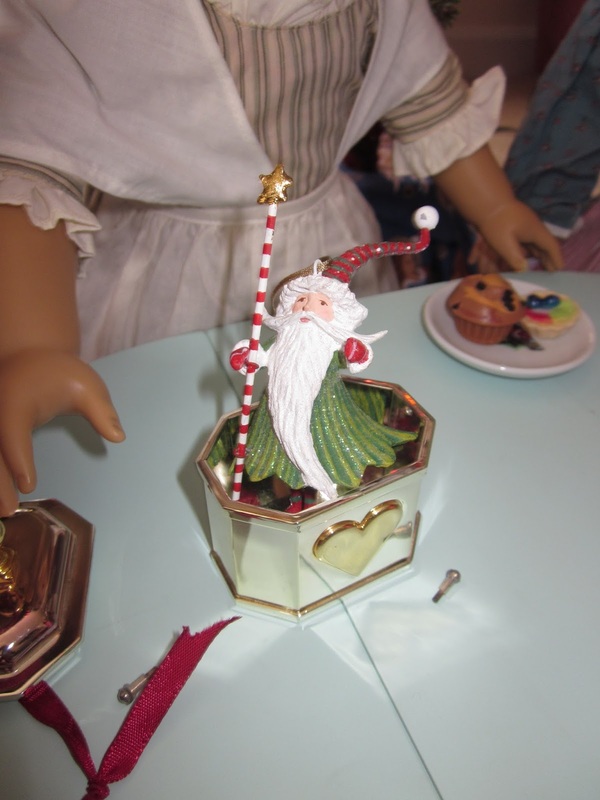 Felicity slid the tiny pegs out of the box, lifted the lid and peered inside. 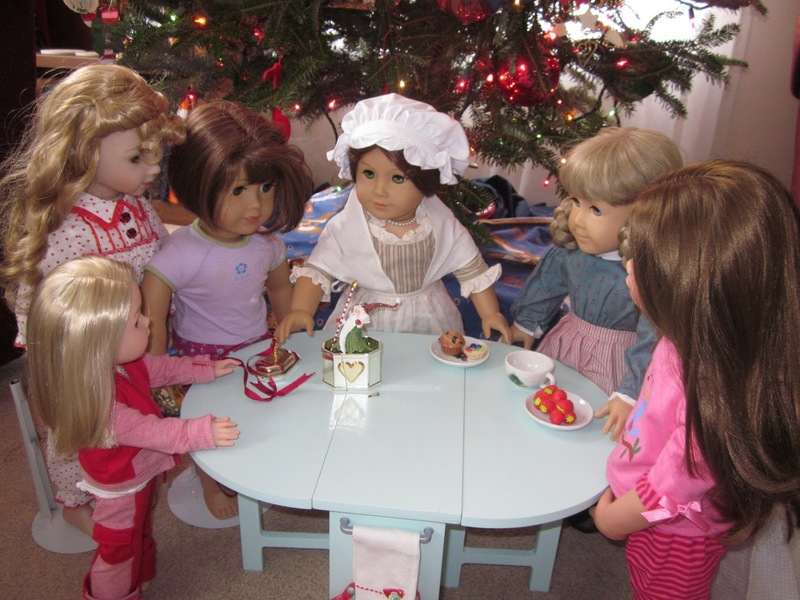 The other dolls crowded around and looked inside to see the green leaves resting on the bottom of the box. 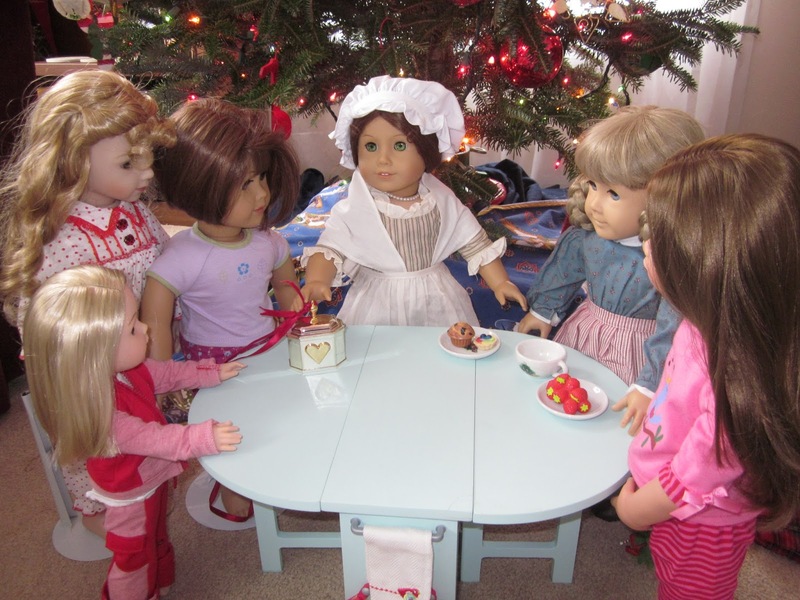 The moving leaves, or what they thought were leaves, but actually turned out to be a robe, suddenly stood up tall and looked around, making the dolls gasp. 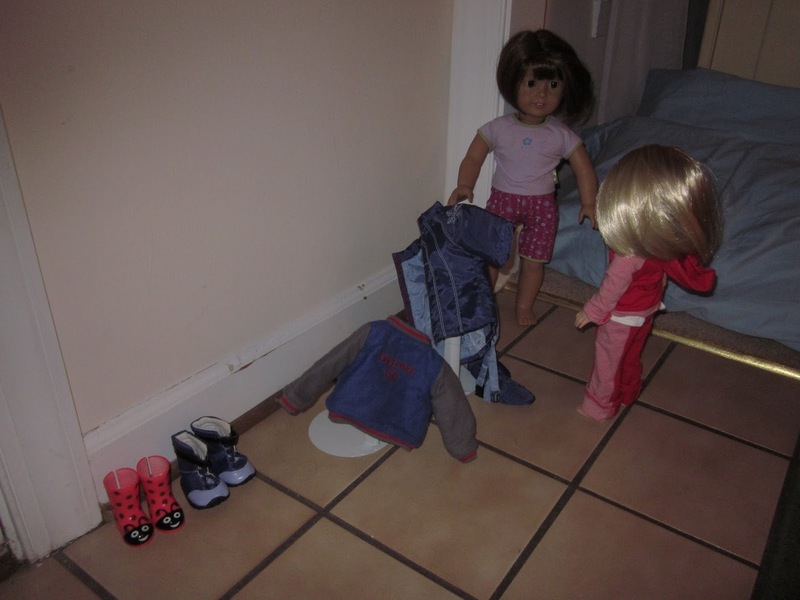 And it leapt from the box and flittered off and away, leaving the dolls silent, staring, stunned. “What was that?” Annaleis asked at last. 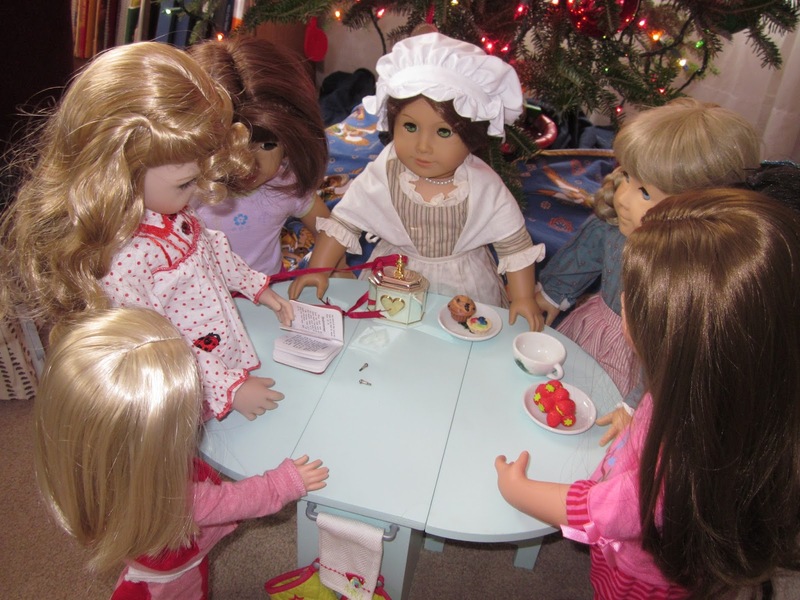 “We should make some porridge and butter!” Sophie cried. “LOOK!” Katelynne couldn’t help interrupting Kirsten, for something else had popped out of the box like toast from the toaster oven! “Read it, Annaleis!” Camille said. “Midwinter night’s cold is hard. Snow shines white on fence and spruce. Moon beams bright on snow-capped roofs. 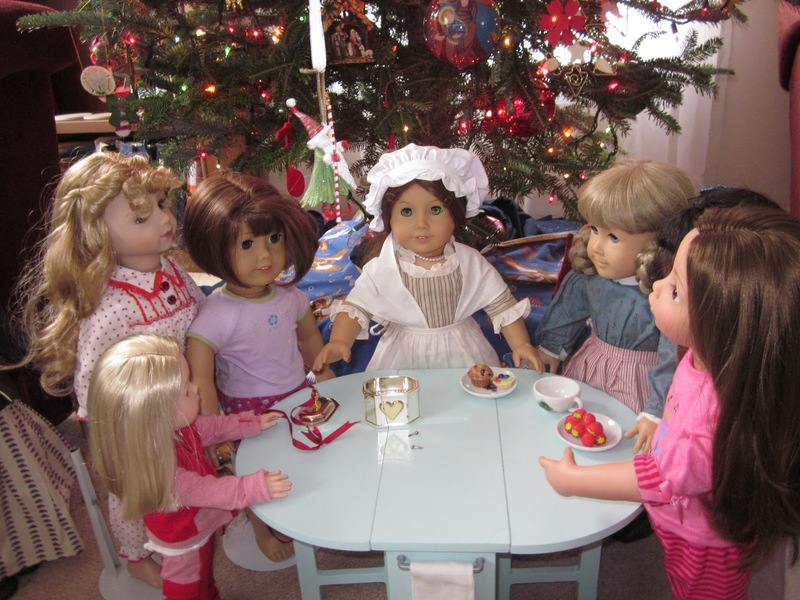 Behind the Scenes: I got to spend a most wonderful week with family in VA for Christmas and yes, all the dolls you see came traveling with me! 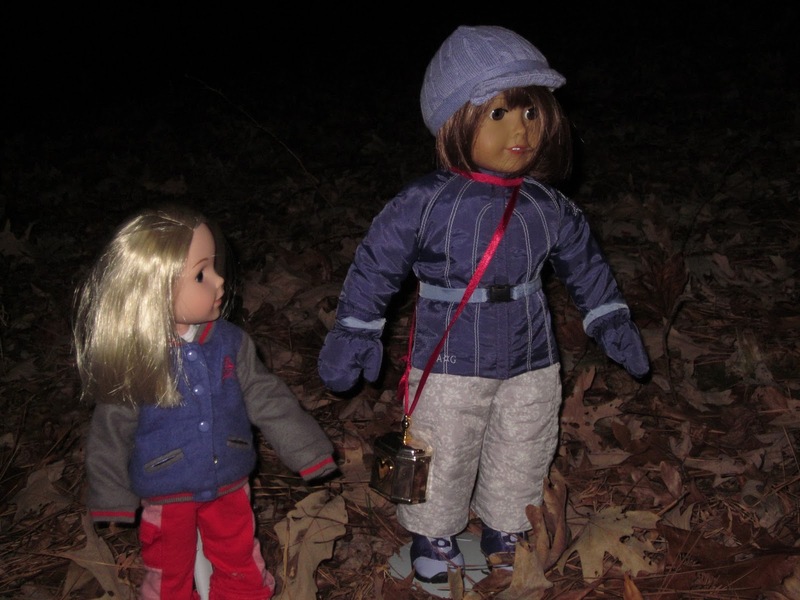 Despite the unusual cold (at least for VA) I took Katelynne and Camille out very late during the night of the full moon, and like the two dolls, I tried to find the fairy house but never found it! 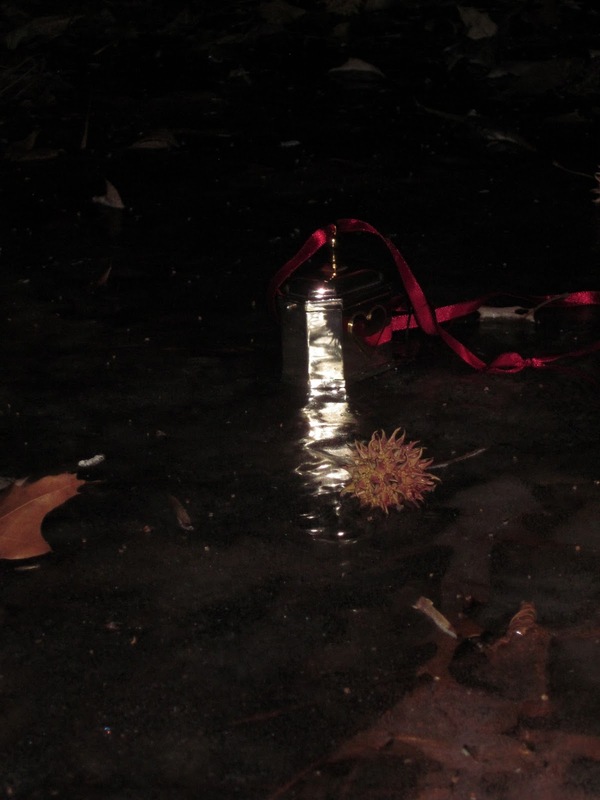 Instead I came upon the ice covered forest floor and here you have the story! The wonderful verses (*) were taken from a poem written by my dear Aunt. 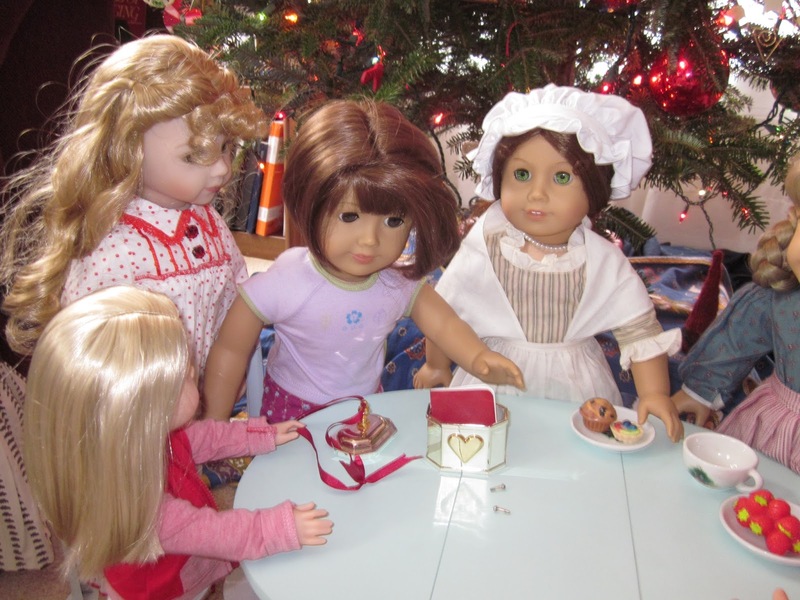 We also had a special Christmas moment where she gave the dolls the heart shaped box and the jultomte story, and Camille’s sleeping bag! The juletomte story that Annaleis started reading is a real book called ‘Only Tomten is Awake’ based on Viktor Rydberg’s Tomten as told by Spencer Harden. 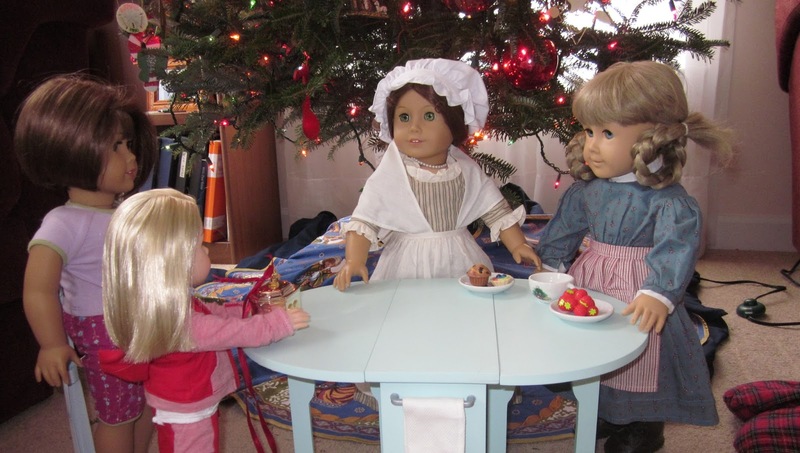 Stay tuned for upcoming historical adventures of Felicity and Elizabeth! Aww, I love this story so much! It’s so cute and creative! I can’t wait for the adventures of Felicity and Elizabeth, too! Wonderful story with plenty of surprises! 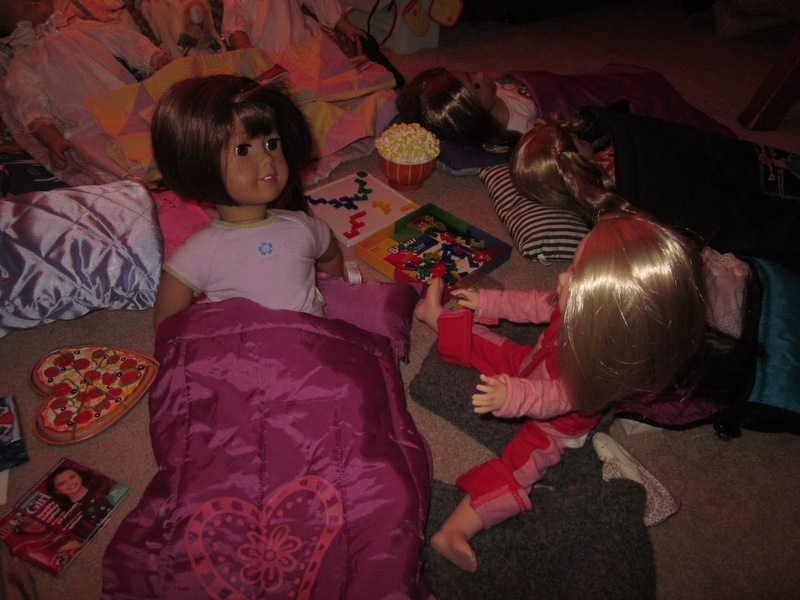 I was always the person at sleepovers listening to all of the different sounds than I was used to. Next time we need a behind the scenes post to see how you transported this crew! Were you able to actually go to sleep? Hahahaha! Yeah it was quite the ordeal! My family was laughing at me saying it looked like I was moving out there with all the boxes I was bringing! 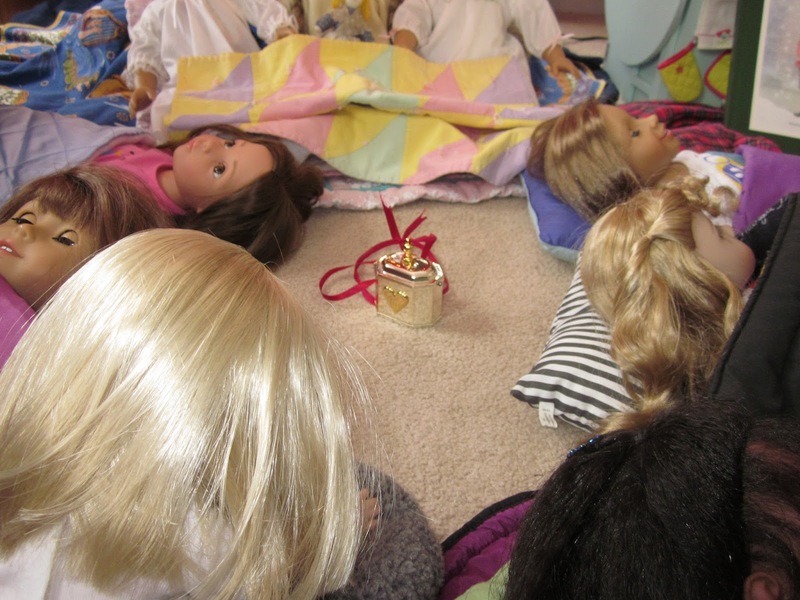 The dolls themselves were stuffed in the travel bags and backpacks and sat in the back seat next to my sister who enjoyed them! I should’ve taken a pic! I’d sleep but then be awake at 5 am, knowing that it would be hours till everyone else was up! I think it’s awesome to brought a big crew along!